My garden is overflowing with greenery, and everything I planted this year serves a purpose. Some are food for me, some are food for my dogs and some are food for my bees. Some a pest deterrents, some are trap crops. Each one is uniquely useful, but there are definitely a couple plants that seem to be in my kitchen or on my mind almost daily. Collards are a staple of southern cuisine and also extremely easy to grow. Most collards take 80 days to mature but the strain propogated by Fedco Seeds takes only 60, nearly three weeks less and we happen to sell them at Biofuel Oasis, where I work. It produces massive 12-18in long leaves whose waxy coating makes them both mildew and aphid resistant. They are juicy and tender and very flavorful but the ribs are tough and needs to be removed before cooking. I’ve been cooking these as a side dish for almost every meal and added them to a quiche with excellent results. They add color and texture as well as a huge dose of vitamins K, A, and C and I also love dehydrating them in place of kale for chips for a crunchy snack that satisfies. 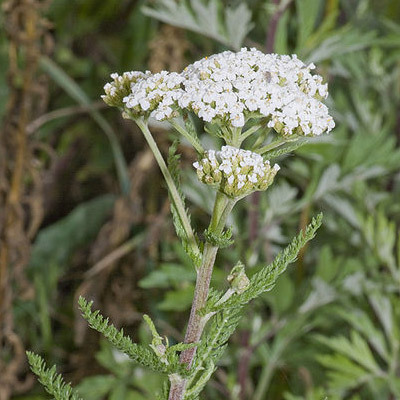 Yarrow is a spectacularly undervalued herb in most gardens. It is often planted as an ornamental in its yellow or red blooming form. The colorful blooms are a beautiful contrast against its silvery green leaves, but the white variety is the most medicinally potent. For this reason, I planted two varieties, one for looks and one for use, though even the colorful variety is still an wonderful aromatic.Yarrow prefers well drained soil, and full sun, but can survive in partial shade. It handles our acidic clay soil in the East Bay quite well and can thrive in nutrient-poor conditions. One of the most effective uses of Yarrow is for halting bleeding by applying crushed green leaves to the wound. The root is also an effective analgesic that can be chewed to alleviate toothache and reduce gum inflammation. A tea made from the leaves and/or flowers will open pores and raise body temperature and is said to air in breaking fevers. Dilute tea is also effective in regulating menses. Of course Yarrow has a whole other usefulness too. It’s an excellent pollinator attractant and one bloom will often play host to numerous bees at once. The blooms are long lasting and numerous, and can provide nectar and pollen even during dry times as the plant is extremely hardy and drought tolerant. This plant is also very easy to propagate from small root segments which is exactly what I did by pulling up small shoots in neighbors’ yards to plant it in my own. I also use Yarrow in my herbal infused bee food which I make fresh every couple weeks. This one is pretty straight forward. Scarlet runner beans are highly productive and will continue to bloom if beans are harvested continuously. The blooms attract all manner of pollinators including honeybees, native bees, butterflies, and humming birds. Vines grow up to 20ft with bright red blooms and lush green leaves along the entire length. When pods are picked young, before they begin thickening, the entire pod is edible like any green bean. Later, when beans mature, they can be left on the vine or picked to dry and storage beans. At this point, the pod walls become hard, fibrous and undigestible, but the beans are large and flavorful when cooked in soup or chili, or as a dish on their own. According to Eric Toensmeier, author of Perennial Vegetable, runner beans can overwinter in climates that remain above 23 degrees Fahrenheit, however I don’t know anyone who has tried to do this. I plan to try it once these beans have spent themselves out by mulching them over for the winter to keep them cozy and warm. Mullein has nearly three dozen names including Our Lady’s Flannel, Clown’s Lungwort, Shepherds Staff, and my favorite, Hare’s Beard. The leaves and flowers of the plant contain most of the medicinal potency, though some applications for the root are said to exist. Mullein is mainly used as an anti-spasmotic which works wonders to alleviate coughs and or gastrointestinal cramping. It is also a mild sedative, so it is best taken at bedtime, lest it leave you feeling drowsy. However, combined with catnip, mint, lemon verbena, sage, and lavender, it makes a soothing and delightful sleep tonic. The leaves and flowers can be used fresh, or hung to dry for later use. The plants can grow up to 3ft wide with a single flower spike up to 8ft tall, whose lemon-yellow flowers are appealing to hummingbirds and butterflies as well as honeybees. The leaves are large and velvety soft and, because they grow as weeds in many places, hikers and backpackers have often used them as trail-side toilet paper. Mullein has a two-year growth cycle but isn’t a true perennial as it only blooms its second year, however it does reseed itself prolifically. Fear not, it is easy to weed out when it is young and is easily shaded out by faster growing plants which keeps it from being aggressively invasive. It grows best in full sun and is another plant which can thrive in nutrient-poor clay. It does however prefer moderate water, especially in its second year while blooming. Okay, this is a bit of a no-brainer. Zucchini is a big food-producer. It takes almost no effort to grow and is easy to cook in a wide variety of ways. Our plants are producing huge sweet zukes every day and we can’t keep up with harvesting them so some have gotten a bit bigger than intended. I recommend every beginning gardener plant a few because it is incredibly rewarding to produce such a bounty as one’s first experience and even as an experienced backyard farmer it is good to know you have one fool proof crop in the garden in case everything goes haywire. All they need is sun and rich soil. They don’t like their roots disturbed to place them in a area where they have plenty of room to spread. In my home zucchini is used in just about anything from quiches to curries, and dog-food to fritters. It freezes well for later use in zucchini bread or pasta sauce and also keeps whole for quite some time. It ripens in perfect time with grilling season and there is something almost magical about plucking a vegetable and taking to straight to the grill without ever touching a kitchen counter or pantry. Somehow home grown veggies will always taste sweeter. Right now, these five are my big favorites, though there are certainly many others in the garden that I love having quick access to. I expect that there will be a whole different set of favorites as the seasons change. What are your favorite garden products?